In 2016, more than 1 million people applied for asylum in Europe. The immigrants share of the population increased most during this time in Sweden, Hungary, Austria and Norway, with at least 1 percentage point. While that rise might seem small, even a 1-point increase in a single year is rare, especially in Western countries. Recent migrants added to already substantial foreign-born populations living in Sweden, Norway and Austria – all nations in which the foreign born make up 15% or more of the population in 2016. Sweden had the greatest increase, rising from about 16.8% in 2015 to 18.3% in 2016, a 1.5-percentage-point increase. The foreign-born shares in Norway (15.3% in 2016) and Austria (18.5% in 2016) increased by about 1 point over the same period. The United Kingdom and France – countries with significant immigrant populations – received far fewer asylum applicants relative to their population size in 2015-16 than other countries, and each saw a relatively modest 0.2-percentage-point increase in their foreign-born shares (to 13.4% in the UK and 12.3% in France for 2016). Germany received the most asylum seekers of any European country. But because of its large population, its foreign-born share rose by an estimated 0.7 percentage points to 15.6% in 2016, a substantial but significantly smaller increase than in other European countries. On the other end of the spectrum, nations including Lithuania, Spain, Slovenia, Estonia and Latvia saw their immigrant shares decrease during this time. 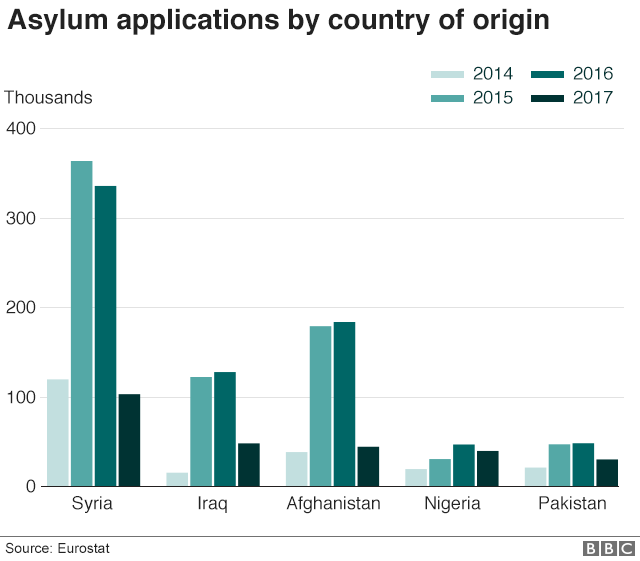 This is in part because these countries did not receive a high number of asylum seekers during the past year. The top countries by origin of asylum seekers in the EU since 2014 are Syria, Iraq, Afghanistan, Nigeria and Pakistan, which are countries with recent or ongoing conflicts. 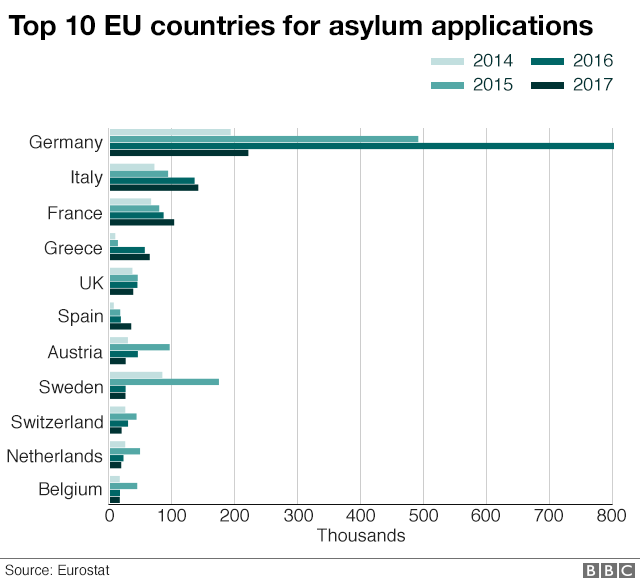 Asylum seekers from Eritrea, Bangladesh, Somalia, Iran and a number of Sub-Saharan countries are among the top 10 countries of origin of those who have been applying for asylum in the EU since 2014. BBC News, (2018).